"I love photographing, especially when I got my iPhone 7 Plus with all-new dual 12 MP cameras. But quickly my iPhone got stocked, I need an easy way to transfer my iPhone photos to computer, any one can help?" Actually, photos are the second element following videos to occupy iPhone memory, making transferring photos from iPhone to computer prevalent. You can delete the downloadable videos or movies without regret, but you may think twice before move those unrecoverable and monumental photos you take with friends or families in a special place and time. To help you transfer iPhone pictures to computer for releasing the device memory, backing up as well as sharing in the future, here are 5 best ways guiding you to copy photos pictures from iPhone XS Max/XS/XR/X/8/8 Plus/7/7 Plus/6S/6S Plus/6/5/SE to Windows PC and Mac. How to Transfer Photos from iPhone to Computer Easily? DearMob iPhone Manager is a brand-new iPhone photo transfer tool aiming at moving HEIC, JPG, JPEG, TIFF iPhone photos and images with different sizes and resolutions between idevice (iPhone iPhone XS Max/XS/XR/X/8/7/6S/6/5/SE/iPad etc) and computer. You are allowed to transfer one single picture or batch-export several photos on iPhone with one click in seconds to your computer with original quality remained. No matter how fast the image quality improves and resolution climbs, this iPhone Photo Manager gives you confidence to save all the images you like even you're using a 16GB iPhone, and get more storage space for videos, music, apps, etc. Don't worry about your iPhone memory any more, just transfer iPhone photos to computer to save in 3 steps. Click the download button below to download this iPhone Photo Manager, install and launch it on your computer. Connect your iPhone to computer with the original Apple iPhone USB cable. Once connected, you are asked to "Trust This Computer" to continue when there is a message popping up on your idevice. Click Photo Transfer icon on the main UI of this iPhone photo manager, and then it will direct you to the photo transfer interface. Just choose one image or several pictures you want to transfer and then click Export button in the upper left banner of this iPhone Photo Manager to auto backup iPhone photos to PC. Please remember the process described here could also apply to iPads, and you can use DearMob iPhone Manager to transfer photos from PC to iPhone and handle the new iPhone image format HEIC like backup HEIC to computer as JPG. 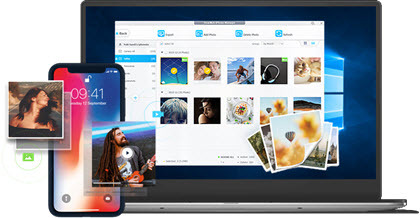 Besides copying iPhone photos to computer, DearMob iPhone Manager's Pro version is capable of handling 12 different types of file transfer between iPhone iPhone XS Max/XS/XR/X/8/8 Plus/7/7 Plus/6S/6S Plus/6/5 etc and Windows, including Photo, Video, Music, Book, Ringtone, Voice Memo, App, Notes, Calendar, Contact and USB drive. Before transferring pictures from iPhone to computer, make sure that you have the latest version of iTunes on your PC or Mac. Transferring photos from iPhone to PC/Mac requires iTunes 12.5.1 or later. Then connect your iPhone to your computer with a USB cable. Once connected, a "Trust This Computer" message pops up to remind you to tap Trust or Allow to continue. Step 1. Connect your iPhone to computer. When the AutoPlay window appears, click "Import Pictures and Videos using Windows". If you click OK now, all the images on your iPhone will be transferred to computer. Step 2. Click the Import Settings link and a window pops up showing you different settings including the target folder you want to import iPhone photos to by clicking the Browse button. Step 3. After setting up the import options, click OK to transfer photos from iPhone to computer. You can choose a tag you prefer to tap when you have imported these files. Notice: Only Camera Roll photos can be transferred via AutoPlay. If AutoPlay fails to work, you can either transfer iPhone photos to PC using Windows Explorer, or import iPhone photos to PC with DearMob iPhone Photo Manager which allows you to choose specific photo to move. For Windows 8 or 10 users, you can use Photos app for Windows to transfer photos from iPhone to PC, and collect, view, or edit your photos. Step 1. 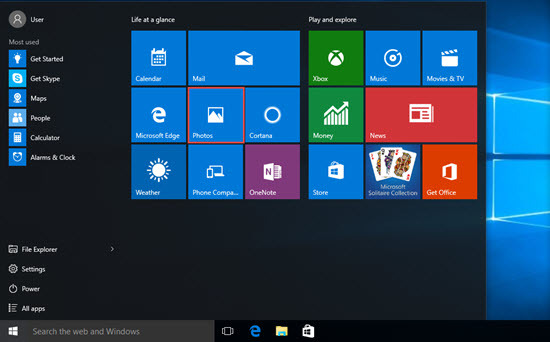 Connect your iPhone to Windows 8/10 PC ->Open Photos app –> Scroll down to the bottom -> Click Import. Step 2. Choose the iPhone you want to import your photos from. Step 3. Photos app will automatically detect all photos on your iPhone, and you can click Select all to get all your photos from iPhone to Windows 8/10 PC at once. 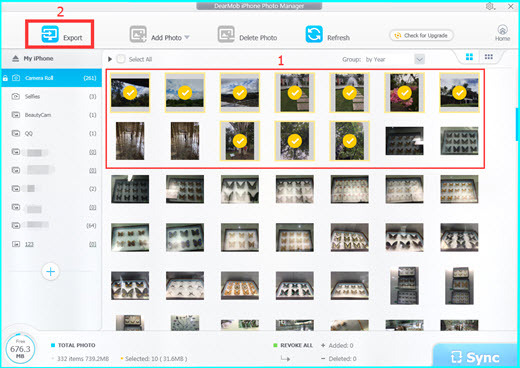 Notice: Photos app will automatically detect all photos on your iPhone, and you can click Select all to get all your photos from iPhone to Windows 8/10 PC at once. Like Windows 8 and 10, there is also a Photos app for iPhone photo transfer on Mac. The Photos app automatically opens when you connect your iPhone to Mac with USB cable, if not, please manually open the Photos app. Step 1. Connect your iPhone to Mac. Step 2. When the Photos app opens, it shows you an "Import" screen with all the photos and videos on your iPhone. If the Import screen doesn't appear, please click the Import tab at the top banner of the app. Step 3. 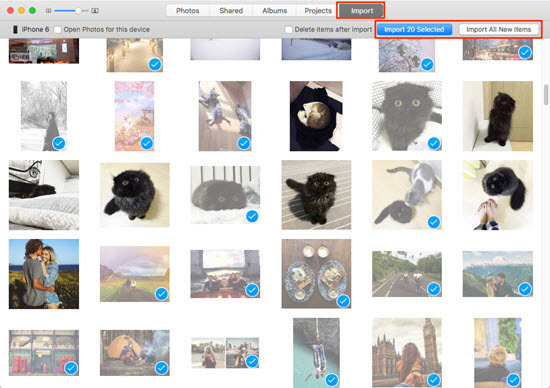 Choose one or two images you want, and then click Import Selected to start copying photos from iPhone to Mac. To transfer all new photos, just click Import All New Photos. Notice: When the transferring process finishes, there is a message box asking if you want to keep or delete the photos on your iPhone. You can click Delete to remove the original images on your iPhone, or Keep to keep them on the idevice. iCloud is a popular way for storing photos and pictures, as well as transferring photos from iPhone to computer or vice versa. With WiFi connected and valid Apple ID, it allows you to wirelessly upload new photos or videos to your personal account and view anywhere anytime on iPhone, iPad, iPod touch, Mac and PC. You can directly watch your iPhone photos on PC or Mac with network required, or you can download iPhone photos to computer for offline enjoy as well. Step 1. Sign in with your Apple ID to access your iCould personal center on iPhone and computer. Step 2. Choose one photo you like to upload -> tap the Share button at the bottom left corner of your iPhone -> choose Add To iCloud Drive -> choose the folder you set to save your photo, and then it will automatically sync your photo to iCloud on your computer in a flash. You may find you can only select one picture each time to upload, that's really inconvenient indeed. Step 3. Go to your computer, click Photos button in your iCloud. A window with all photos you upload shows up, choose one or several photos you like to download and then click the download arrow on the top right of iCloud Photos. Now the photos on your iPhone have been downloaded on your computer, you can find them in your Downloads folder. Notice: iCloud allows you to take various beautiful pictures in different places and enjoy them at home easily. However, it requires network for uploading and only offers 5GB storage space for free storing. * iPhone including a lightning connector. * iOS 7 or later installed on iPhone. * Mac powered by OS X Yosemite or later. To transfer iPhoto photos to computer, you need Dropbox that is similar to AirDrop. Download and install Dropbox app on both your iPhone and Windows PC -> open Dropbox on iPhone and switch to Uploads tab -> press + icon at the top left corner to choose the photos you want to transfer -> choose an upload destination and start uploading. Now you get to your computer, and the photos are ready to be downloaded to your Dropbox folder. Comparing all the 5 ways, you may find each has its strengths and shortcomings. In conclusion, DearMob iPhone Manager is mostly recommended for you to transfer photos from iPhone to computer without any network connection once you have downloaded it. As a professional iPhone file manager, you can also handle various videos, music, apps, etc between idevices and computer as easy as you can imagine if you upgrade to the pro version.